Squirrels are amazing, fun to watch and provide a lot of entertainment. Squirrel feeders provide resourceful squirrels a good way to obtain their own food. Giving the squirrels their own squirrel feeders can be as enjoyable as watching wild birds at their feeders. Also, by giving squirrels their own feeders, they may not don't bother the bird feeders. 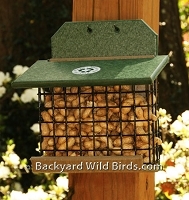 In addition, some of these Squirrel feeders will also attract wild birds. Fill your squirrel feeders with the corn, peanuts and mixed nuts shown here and let the fun begin! 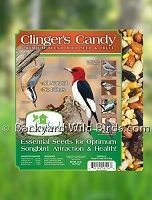 Clingers Bird Seed 20 lbs is an ideal seed mix with All Natural Seeds and No Fillers! These ingredients include Peanuts, Tree Nuts, Sunflower Meats, Cracked Com, Black Oil Sunflower, and Pumpkin Seed Kernels. Critter Munchies 20 lbs is an ideal mix for feeding nature's little critters. Squirrels, chipmunks, rabbits and Woodpeckers go crazy for Critter Munchies. 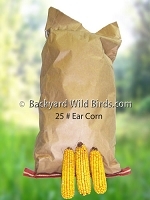 Ear Corn 25 lb Bag is perfect for stocking squirrel feeders and hanging out for larger birds. See all the different Squirrel Feeders that it can be used with. Feeder Whole Peanuts is 10 lbs. of nutritious treat that attracts Woodpeckers, Titmice, Jays, Chickadees and a lot of cute critters. Also works well in Squirrel Feeders. Bird Feeder Peanut Halves is 10 lbs. of shelled peanuts. All Natural and No Fillers! A nutritious treat that attracts Woodpeckers, Titmice, Jays, Chickadees and a lot of cute critters. Squirrel Bungee Corn Feeder is an entertaining way to feed squirrels. 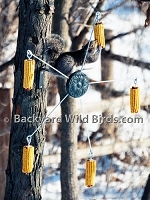 Put up a Squirrel Bungee Corn feeder and watch squirrels as they bungee jump for the corn. Up and down they go. 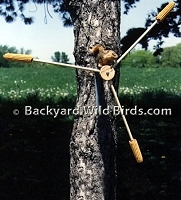 Squirrel Corn Spinner can mount it to a tree or post, then put some corn on it and enjoy the squirrels! The Squirrel Corn Spinner is a very entertaining squirrel feeder! Squirrel Diner Feeder is a metal squirrel feeder that holds peanuts, corn and large seeds. The squirrels will soon figure out to poke their nose under the top lid to get themselves a snack. 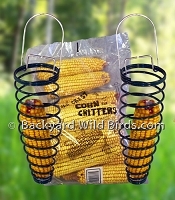 Squirrel Ear Corn Feeders holds ears of corn in its spiral for squirrels to feed on. Hang it from a tree, branch or fence and enjoy feeding the squirrels. Squirrel Go Round Feeder featuring a decorative cast aluminum center medallion and 5 corn spokes. Great fun when more than one squirrel wants one of the corns. Squirrel Peanut Feeder is a whole peanut feeder that squirrel will love to get their treat from. The Peanut Feeder is also a favorite of Woodpeckers like the Red Belly and Downy. Made from recycled plastic. Squirrel Trap Transporter is good way to fix a squirrel problem. If you are overrun by squirrels and they have you at wits end then it is time to take action with this carrier cage. Squirrel Whirl Feeder provides a rich environment for squirrels. 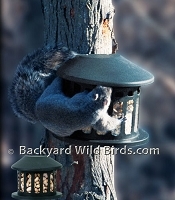 The Squirrels weight causes the feeder to rotate. It swings and spins as the hungry acrobats grab a bite to eat.